Fall is finally here and the weather is starting to change. I put together some fall accessories that are on the top of my wish list. 1. These lovely glasses from Bonlook. The frame I like is a square frame called Dylan. As a glasses wearer, I'm always looking for stylish frames and these are no exception. 2. The perfect oxblood fedora for covering up bad hair days or just finishing off an outfit. 3. Lace up leopard heels to add a fun neutral to any outfit. These are similar to the sandals from Zara but only half the price! 4. A glam jewel-toned statement bracelet that's a beautiful finishing piece. 5. This chic bag from Dorothy Perkins (on sale!) that is a great smaller sized bag and will make a great addition to any fall outfit. 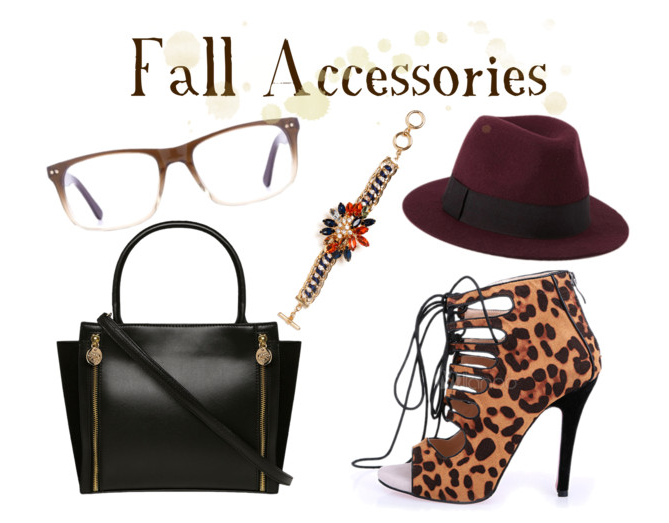 Hopefully these accessories will be making their way into my closet soon!